CHARLOTTE - It was one of those made for television Carolina autumn days -- not a cloud in the sky, a gentle breeze sifting through the oaks trees. It was a perfect day for golf. But for my Callaway Great Big Bertha Driver, it must have seemed like the day from hell. Yes, the apocalypse was upon my once great golf club, as lying next to it was a sign of the times. 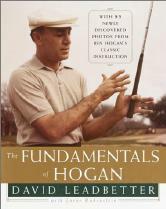 Wrapped in its soft leather head cover was the Hog Driver. The biggest, baddest golf club that I have ever laid eyes on. Never in my wildest dreams did I think I would run upon the club that would make my Callaway look like a five-wood. But is bigger better? I had just the way to answer that question. Nothing short of a mano-a-mano, big head to bigger head contest out on the playing surface. 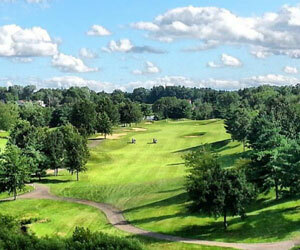 The course: Rocky River Golf Course in Concord, North Carolina, just 15 minutes north of Charlotte. The situation: a Monday afternoon with only six cars in the parking lot, and nine open holes waiting for an all-out war. The format: two drivers, two balls of the same make and model and may the best club win. Oh yea, and just one minor challenge facing team Big Bertha: the Hog Driver by the Dog Leg Right Corporation has been deemed "nonconforming" by the USGA because of the spring-effect (previously thought of as the disease that caused golfers to miss large quantities of work in the months of April and May) of the club face. But rules be damned! Think Gladiator, if you will. The Callaway being more of the Russell Crowe, mere mortal type, and the Hog being the tricked up chariot with all the spikes and stuff. The first hole is a medium length par 4 with no real trouble to be had. Big Bertha went straight down the middle, close to 260 yards. The Hog was struck slightly less than pure by yours truly, but still flew about 230 yards down the right side of the fairway. The third hole is an average length par 5 that is reachable in two if you hit the drive of your life. That is exactly what the Hog provided me with on this hole. If you have read our Rocky River Course review, you know there is a HUGE boulder that sits in the middle of the fairway on this hole, about 230 yards from the back tees. A slight miss hit with the Callaway left me about 10 yards short of the boulder and just to the left. Finally, after two less than spectacular drives with the Hog, I hit pay dirt. Perhaps you can't really define spring effect until the first time you feel it. When I walked out to my ball, I had about 170 yards left to the green. Translation: with a little help from Mother Nature, the Hog had just helped me into a 315-yard drive. The ninth hole is a healthy par 4 that doglegs slightly to the right. The landing area is the size of those airplane hangers at the Atlanta airport, so it was time to open the stance, and see what the Hog could do with a high cut shot. The Callaway handled the shot like a champ, and put the ball out there about 230 yards. The Hog seemed to love this shot like it must love its name (if only it would respond when prompted). The drive from the Hog started out straight, and did not cut until about two thirds of the way through ball flight - thus preserving a boatload of distance. Result? Hog bested Bertha by about 20 yards. After the round, I headed to the driving range to fire off a bucket of balls with the two punch-drunk fighters. The Callaway is no slouch, but with the spring effect, and its longer shaft, the Hog was consistently 10-15 yards longer. The Dog Leg Right Corporation says that the Hog is able to provide you with these Tiger-esque driving distances because of the way it is crafted. "The HOG Driver's Beta Titanium head is manufactured using a proprietary, two-piece forging process. The thin-walled face, sole and neck are all forged from one piece. This proprietary manufacturing process is a major breakthrough that ensures accurate loft and lie specs and also allows us to maximize performance, sound and feel." Whatever. Bottom line is, this thing is long. Sure there are some theoretical and moral underpinnings, such as "Am I cheating if I use this piece of equipment?" But no game embodies the famous saying, "if you ain't cheating, you ain't trying," like golf. Besides, this is a capitalist society to which the spoils go to the wealthy. And at a suggested retail of $600 big ones, if you can afford the Hog you've already cheated someone out of their money at some point. Why stop now? The Hog Driver is probably 10-15 yards longer than the driver you are using now. But it is not the cure for all that ails your game off the tee. Tee shots that are not hit flush don't travel any further than miss hits with a USGA sanctioned driver. At 45.5 inches, the Hog is probably a little longer than the driver you are using now, and it could actually be more difficult to control for a high handicapper. If you are a pure ball striker, and can deal with the fact that you are playing with an illegal club, the Hog will take your drives to new levels. Head Material / Size: 2 Piece Forged Beta Titanium / 310cc. Manufacturing Process: Forged (vs. Cast) permits a thinner face, yet is stronger due to tighter grain structure. Benefits: Longer distance; improved "energy transfer" (highest "smash factor" of 1.6) with an improved sound and feel; yet more forgiving with greater aerodynamic qualities. Shaft: Graffalloy ProLite (65 grams) "tip stiff" (higher flex point); available in stiff and regular flexes.